• 14 hours of Tango lessons with world class professional dancers, 1 night at Tango dinner show, 4 escorted visits to milongas + tours to sight see, shop and soak up the cultural vibrancy of the World’s Tango Capital. Full hosting and accommodation with buffet breakfast. Located in the historic tango neighbourhood, where the tango singer Carlos Gardel lived most of his life, the ABASTO HOTEL (5 stars) is an ideal base to explore all the City. It hosts the famous CITA (International Tango Congress) thanks to its great facilities and floors for dancing. Also, it is situated in front of one of the biggest mall Shopping Centres of the City, the Abasto. The building was the central wholesale fruit and vegetable market in the city (“Mercado de Abasto”) from 1893 to 1984. Since 1999, it has served as a shopping mall. A short Tube trip will take us to visit the famous Plaza de Mayo and Casa Rosada, where we will stop for a coffee at the famous Café Tortoni, as Jorge Luis Borges used to do. ACCOMMODATION: Buffet Breakfast, Spacious and quite rooms with private bathroom, Air Conditioning, Cable TV, WiFi, Safe, Hair dryer, Terrace with Solarium and swimming pool, Gym, Lounge. We will design for you a very well thought out programme including soirees, restaurants, nights out dancing as well as sight-seeing suggestions. We will spend a day out in the area where tango was born, Caminito, la Boca, with its traditional colourful houses and street tango dancers. Buenos Aires is a wonderful city for meat lovers and vegetarians! We will try all the delicious local deli!! The daily lessons (14 hours in total) will be taught by world class Argentine dancers and teachers. Our friends and colleagues will be happy to teach you the Argentinean way of dancing, the technique, the sequences, that is, the genuine Argentine tango style. Classes will be held in the hotel. After the daily tango class and daily afternoon tour to discover the different area and shops of the City, we are glad to spend our nights out in the Buenos Aires Tango night life. 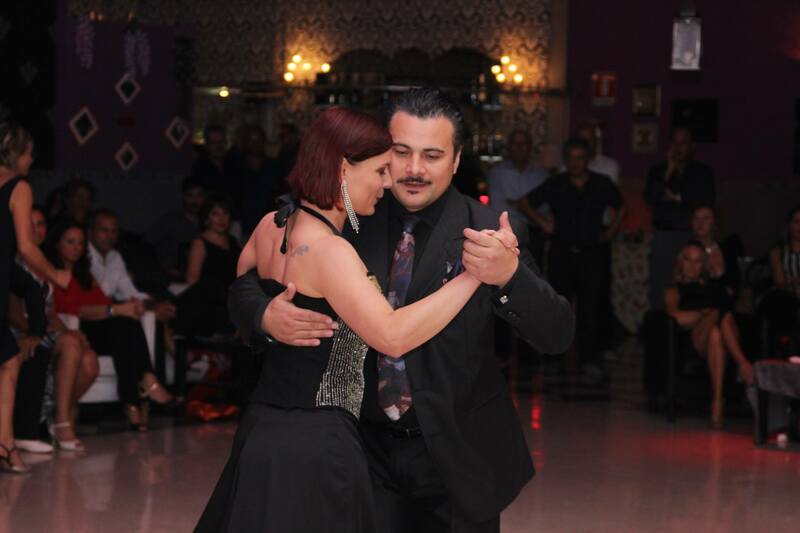 We will get the thrill of stepping on the dance floor of at least 4 pre-booked traditional Milongas, where the tango developed as a local phenomenon and that are now an international attraction. We have the pleasure to invite you to spend a night watching an amazing Tango Show whilst tasting an exquisite Argentinian dinner. In the very heart of the City, a night out in an absolutely elegant Tango theatre with some of the finest tango musician, singers, choreographers and dancer of our times. £ 1125 per person before midnight 30/11/2017 (after 1200). SPECIAL PRICE: The holiday is priced at £1050 per person for all those who joined us on the 2017 trip.